So I used to live there (reminds me of the GnR song "Used to Love Her" but I digress. I am coming back for the 12th time (I went back and forth 8 times out of high school because my Girlfriend still lived there AND she and her friend wanted me to take them to be extras on some show being filmed in Snoqualmie in 1989 and 1990) but again I am veering off point. 1. I plan it around the Twin Peaks festival, however as I have discussed here previously it doesn't hold much in the way of things I haven't seen or done. I mean I went to my friends prom at the Kiana lodge, I have been to Snoqualmie more times than I can remember (I also used to ski) and as you can find out here I have visited most of the filming locations with the only big exception being 708 33rd street in Everett, but I can easily see that on my own. The only draw, and this is a big draw, is that it is associated with Twin Peaks and it has some cast members associated with it. 2. I plan my trip around the Steampunk Festival in Port Townsend. I would probably head over to Victoria first, take the ferry back to Port Angeles and then spend a few days in Port Townsend during their Festival and hopefully have a blast. Because the dates are over a month apart I can't do both, unless I win the lottery. I am leaning toward the latter but I have a nagging voice in the back of my head that keeps saying "Twin Peaks!" Anyone here have experience with both or either of these festivals? Unless you are 100% committed to going to the TP Fest, I would forgo it. (If you are 100% committed, stop reading this and just go to the damn festival!) Even if you COULD get the tickets (very limited) and could afford them, you've seen all the sites and walked all the walks, been there and mostly done that. The steampunk fest sounds pretty freakin cool. So if it were me (which it is not) I would go to the Steampunk fest then head over to the Sno Valley at some point to check out any new sites/locales and maybe meet up for a Ghostwood Kolsch at the Snoqualmie brewery with your fellow TP fans. Great advice, especially since it aligns with my previous thoughts. We also went to Victoria in the summer of 2015 but there was so much more for us to do and see but we couldn't because we had to meet ferry deadlines. 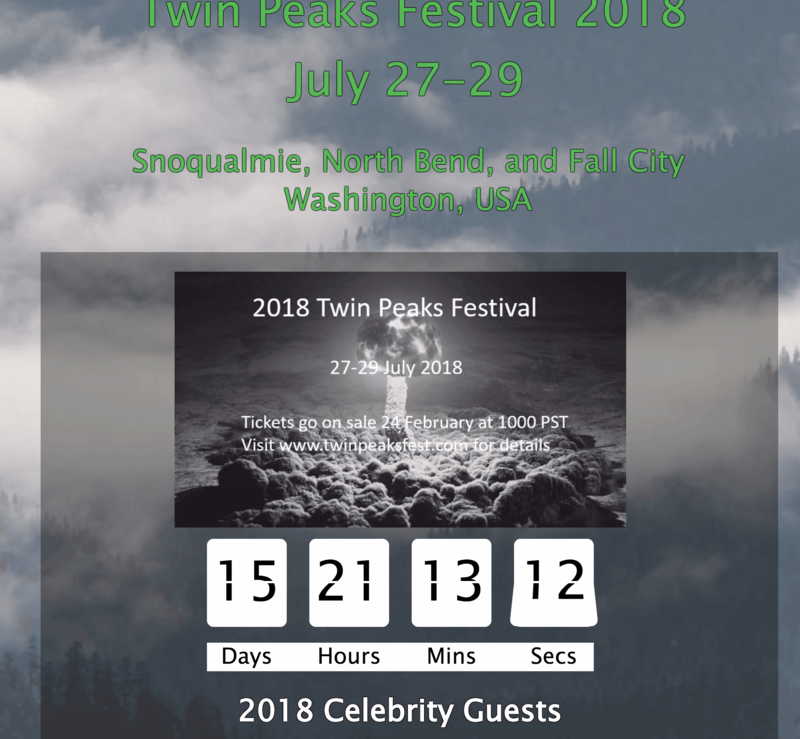 I think Port Angeles to Victoria and back, 3-4 days in Port Townsend and a couple in my hometown of Bremerton sounds like the plan...of course all this is subject to change based on the cast that is showing up for the Festival...I mean it is TWIN FREAKING PEAKS!!! And I can't see the popularity growing any more than it is now. Answered my own question.....the 24th. Wonder how much they are this year? But hey, if that's what you need, you gotta do it. I wonder how fast the tickets go. So what did you decide Jack? I am definitely coming up, the Twin Peaks Festival is sold out so that decision was made for me. It appears as though we are going to drive this time, come up the 101 and stop in Forks, because of the Rain Forest, not because of the Twilight series. I didn't even know the 2 were related the last time I was there so it was an amazing revelation to have this whole sleepy, logging town be inundated with Vampire memorabilia...might have been more than the Bigfoot memorabilia. Anyway from Forks to Port Angeles, take the ferry to Victoria, come back through Snoqualmie and North Bend, a Day in Seattle. Ferry to Bremerton, visit friends, head out to Port Townsend for the Steam Punk Festival and then head back down the 101 to LA. Unless we sell the farm and just stay in Port Townsend. Make sure to find a Ghostwood Kolsch on your travels. And keep us posted. ?